You are currently browsing the tag archive for the ‘street tree’ tag. – major structural fault at co-dominant stem union; major stem wound. 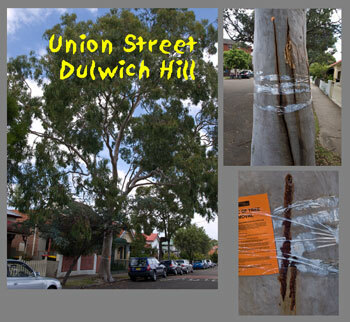 Council says they will replace this tree with a Eucalyptus sideroxylon (Red ironbark), but don’t say when they intend to do this. This tree was in a poor state. I will not be making a submission. The deadline for any comments or submissions is Friday 21st October 2011. In an example of planting for the right conditions, this Ornamental pear street tree on Crystal Street Petersham was planted directly under the boughs of a large private tree that overhangs the footpath above head height. Someone has solved the problem by vandalising the street tree. 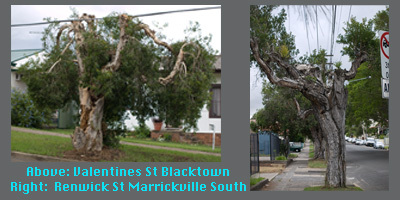 On 19th March, the following 3 street trees were put up on Marrickville Council’s web-site for removal. 1. 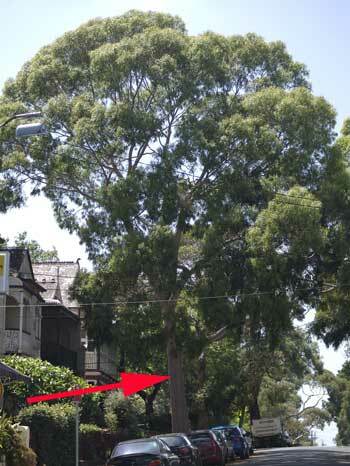 Mature Corymbia citriodora (Lemon Scented Gum) outside 11 Union Street Dulwich Hill. This tree was the first campaign for SoT in June last year. 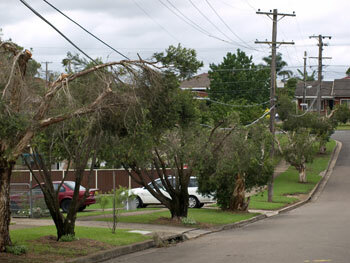 At that time Council said the problem was ‘whole tree failure’ which I & other members of the community disputed. 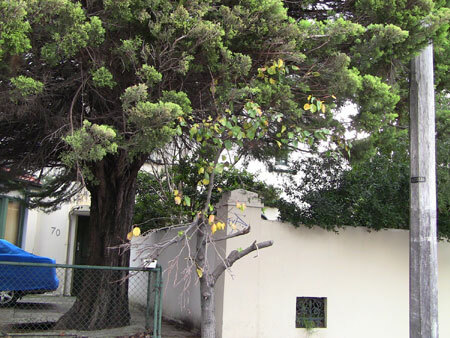 The outcome was Council surveyed the tree & intended to monitor to see if the lean increased. Their report says a lot has happened to this tree since then. This time they say: Asymmetric root–plate development due to restrictive growth environment. (as does a huge percentage of mature trees in Marrickville LGA due to failure to remove cement from around their trunks), buttressing of the base of the tree over the adjacent kerb. This predisposes the tree to wind-throw in extreme weather conditions. 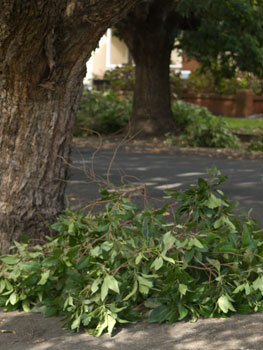 There is also a risk of whole tree failure if the kerb collapses. Extensive structural root & crown decay in the plane of compressive stress. This condition is compounded by the tree exhibiting a moderate lean in the plane of decay. The decay has been caused by the presence of the naturally occurring fungal decay pathogen Armilaria leuteobubalina. The tree is exposed to south-easterly winds in the direction of lean & in the plane of decay. 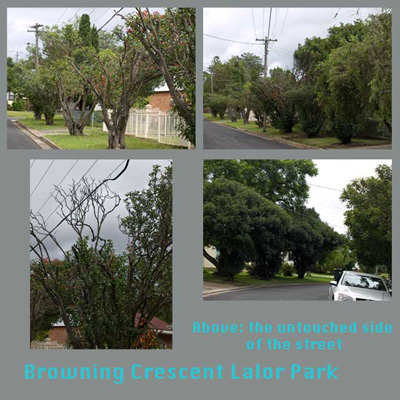 This is compounded by the tree exhibiting an asymmetric canopy, with the majority of the canopy being present in the direction of the lean of the tree (what does Council think of all the masses of asymmetric trees which have been made this way by Energy Australia?) Severance of structural roots on the windward side of the tree as a result of excavations undertaken by Sydney Water. I interpret the above as: this tree is likely to fall over if there is an extreme weather event, especially if the wind comes from a south-easterly direction or if the sandstone kerb collapses. 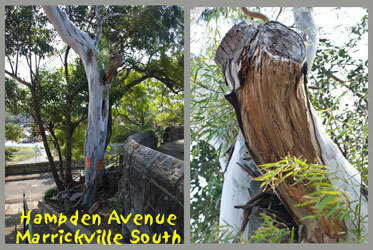 The tree has been placed at risk because Sydney Water severed its structural roots. Finally, the tree has caught a fungal disease & this sews up the argument for removal. As this fungus stays in the ground for a while, Council will not replace the tree for 2 years. Council does not say what species the replacement will be. I went to have a look at this tree & its condition has really changed. In my opinion it needs to go. I can’t identify Armilaria leuteobubalina, but I can tell when a tree is deteriorating & this one is. It has recently developed 2 large vertical splits in its trunk that regardless of the other things afflicting this tree, indicate its demise. Its loss is going to have a dramatic affect on the streetscape as it cascades beautifully over Union Street & is clearly visible from the café on the corner. The deadline for submissions is 2nd April 2010.
breakage. No disagreement from me with this tree. It looks like it has or had borers & they entered via a newly cut branch. 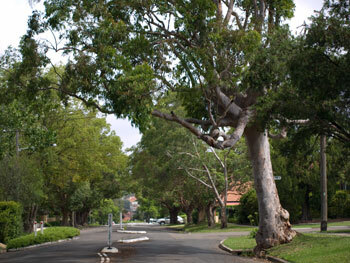 I am pleased to note that Council says they will replace it with a Lemon Scented Gum. 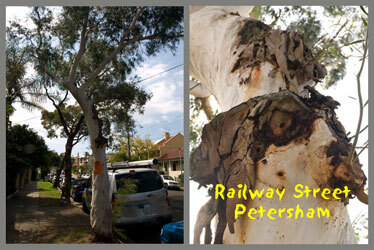 I do know a number of Petersham residents who are worried that Council will remove their Gums. (I just realised how this reads like & will leave it for a bit of fun). 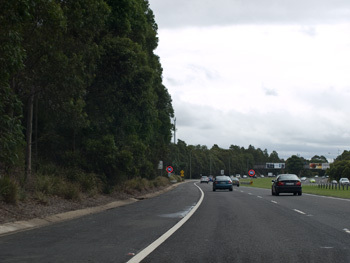 Put in a way that does not sound like dental work, residents fear that Council will remove the Eucalypts, so replacement with a tall growing Eucalypt will please many. The deadline for submissions is 9th April 2010. White Gum). 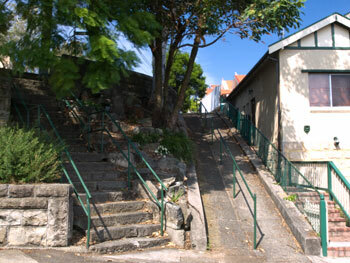 It sits in a lovely little space between 2 types of stairs (ordinary/normal stairs & thrill-seeker/kill off your granny stairs – see photo in this post) that connect Day Street with Hampden Avenue. There are a number of mature trees in this little triangle of dirt. Council’s report says: Extensive column decay in trunk. Termite activity evident. Again, both these were easy to see. I also think the people who live in the house directly next to & below this particular tree may breath a sigh of relief when it goes. They may have held their breath through a few storms, worried that it would crash on their house. I know I would have. 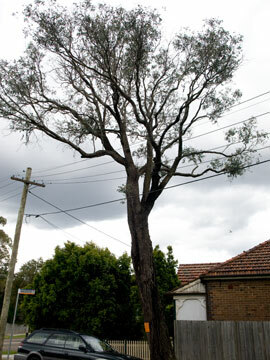 Council will replace this tree with a Eucalyptus microcorys (Tallow Wood), which will be nice. The deadline for submissions is 9th April 2010.
change from previous practice of nailing in the signs & seems more effective because all 6 signs are still in place. I was also very pleased to note the more detailed information provided with the ‘notification for removal.’ Although I recognise this takes more time for Council staff, it helps them in the long run because the community does not have to guess why the trees are up for removal. All 3 notifications & especially the one in Union Street gave clear & descriptive reasons. Coupled with the use of tape instead of nails, this is a great improvement & goes to generating goodwill. Apparently the period for submissions for public trees is 14 days, not 21 as we have experienced throughout the latter half of 2009. Council says they allow 21 days for submissions if the tree is significant in some way. 14 days doesn’t allow much time, but if we are organised, it can be done. It also means that I cannot be slow in noticing new trees for removal on their web-site. I am not going to put in a submission for any of the current trees as I believe they all should be removed.